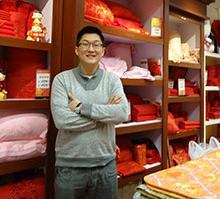 Jerry Qu, President of Mercury Home Fashion, Inc., a retailer of bedding and linens in Queens, started the business in October 2008. He has 5 stores in Chinese communities and sells online, primarily through Amazon.com. He requested SBDC assistance to expand the business because revenue levels had become stagnant and he knew expansion could increase revenue. He also was aware that growth involves increase in operation and sought business and strategic planning assistance. In addition, he was focusing on developing the e-commerce aspect of his business; however the logistics were beyond what he was able to handle himself. After a discussion about strategic planning with Business Advisor Jinguo Zhang, Mr. Qu realized he faced issues in human resources, marketing, and financing. He considered applying for a loan for the expansion of the business and needed to determine the amount of funding needed. Advisor Zhang discussed all the issues with Mr. Qu and provided research information from the Research Network about hiring and training operation managers that would enable him to better plan for the expansion of the business; researching local markets to define his branding strategy; and developing a business plan to outline the expansion and the financing. After considering Advisor Zhang’s technical assistance and advice, Mr. Qu decided to use $200,000 of his own funds to open a new store in Elmhurst, which created four jobs. In addition, he is selling his bedding online through a new website and will ship his inventory from a new West Coast warehouse, which can handle online orders more efficiently.